A roundup of my outfits since we've been having a nice long break and Hubs had the time to snap some photos for me. I'm blessed with a cousin (lookin' at ya, Jean!) that is the same size plus has the same taste as me. This Dorothy Perkin sleeveless top was stolen borrowed from her wardrobe and it all kinds of perfection with vintage perfume bottles printed on a pale blue background. The ruched, jersey pencil skirt was a steal from the Forever 21 sale, fully lined too. Speaking of fashion twins, Jean and I got the exact same Topshop drape-y blouse from the recent Topshop sale at 50% off. We both got it in dove grey when we saw it on our favourite blogger . It's such a versatile, comfortable top that drapes beautifully, perfect for days when you want to go casual chic. 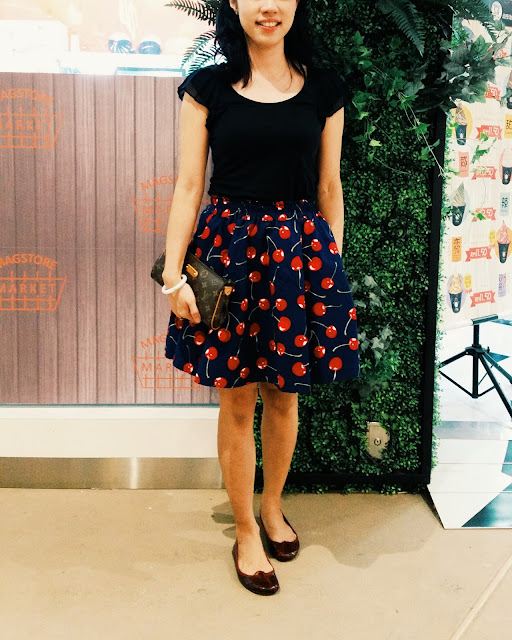 This cheap and cheerful cherry print swing skirt has been one of my best fashion bargain buys from Princess Diary. 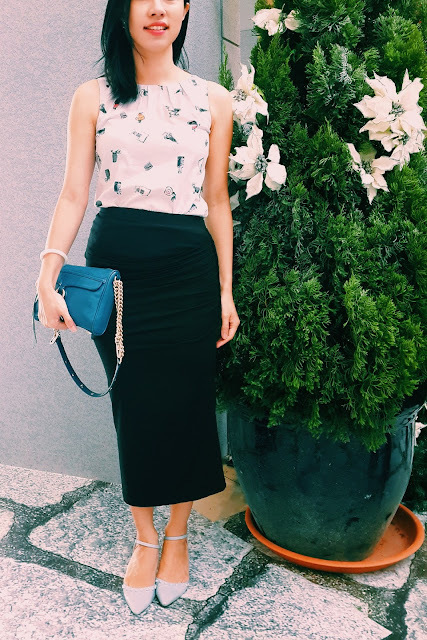 They sell so many cute cotton skirts with the cutest prints and the secret is in the thick, elasticized waists that makes it a perfect fit even though it's free-sized. They currently have some vintage themed ones (think pale green with red roses and white lace hemming). Love, love, love these outfits! Happy New Year to your lovely family and yourself.